Good afternoon everyone! Hope you are all having a lovely Monday so far. Today I thought I would do a post that I've only done ONCE on my blog and that is 'A Week in Photos'. I don't know about you, but I personally love reading these types of posts. It's good to see what other people get up to during the week besides blogging and it's something that in 2014 I will be trying to do on a weekly basis so make sure to hit that follow button to know what I get up to everyday life. As you all probably know at the moment I have my cousin visiting us for Mauritius. She's never celebrated Christmas in a cold country as in Mauritius this time of the year the weather is absolutely amazing and it is so hot so this is a massive change for her but she's loving it. She's disappointed there isn't any snow at the moment though but we are planning on going skiing just before Christmas so I'm sure she'll see that soon! This past week has been very busy for us. We started off at the London Aquarium which I have never ever been too before in my 22 years of living in London so it was good to finally go there. I love sea life and seeing all the underwater animals so I enjoyed that. They had a little 'finding nemo' section with about 100 dorys and a few nemos as well. We then rode a shark (I have photo evidence above -no I'm kidding but I really love that photo!). A couple of days later we then decided to go to the London Dungeon and I absolutely love it. So interesting and creepy at the same time and the drop ride at the very end is just brilliant! Definitely planning another visit there soon. The good thing about the London Aquarium and London Dungeon is that they are right next to each other. Both of those places are next to the London Eye if you plan on visiting them for yourself. 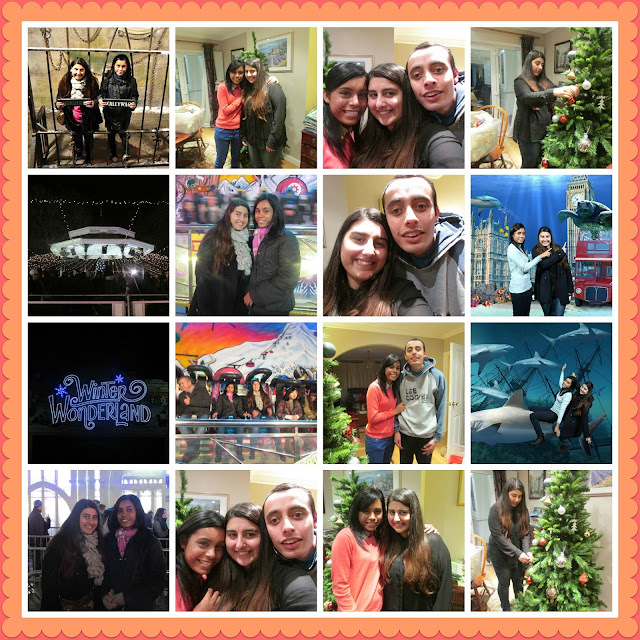 On Saturday we both went to Winter Wonderland and I absolutely love it there. It didn't start off very well as there was a huge queue to get in as it was so busy but once we got on we did some Christmas shopping and went on some of the rides there as well. I'm a massive wimp so I didn't go on the massive drop ride because of my wimpiness! Need to find a way of overcoming that. But anyway, I love Winter Wonderland and I think we are going to be heading back there because we want to go to the Ice Castle and possible the ice skating there too. Then yesterday we spent the day putting up our Christmas Decorations which was so exciting! I love Christmas. We were playing Christmas songs and having a good old sing song. I am going to put up the second part of my Christmas Tag tomorrow with some of the pictures that I took so keep an eye out on that. So there we have it my week in photos. Probably won't be that exciting for you but it was a good week. I will try and post another one next week so make sure you have clicked that follow button on the side to make sure you see when I post. What have you been up to this past week? If you have a blog and have done a post like this leave a link in the comments below and I will take a look at it.